USER-DEFINED PURITY AND RECOVERY OBJECTIVES for batch distillation columns. OPTIMAL PROFILES of distillate flowrate, pressures, and top temperature to reduce batch time. AUTOPILOT to increase productivity while meeting batch objectives. Based on 20+ years of experience in the development of autopilots for the process industry, Online Control, in collaboration with EPFL and industrial partners, has developed and tested O_Distill, a batch distillation optimization strategy to separate complex mixtures into several fractions. In contrast to typical recipe-based batch operation strategies and model-based optimization strategies typically used in the batch distillation industry, O_Distill minimizes batch time and enforces operational objectives on the basis of process and laboratory measurements. Batch-to-batch controller: before each fraction, this controller adjusts the setpoint profiles of key variables (such as top temperature and pressure drop) based on the results obtained at the previous batch. 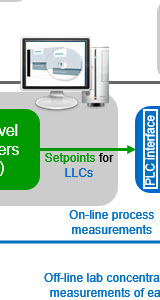 High-level controller: this controller tracks on-line the setpoint profiles by adjusting the setpoints of the customer low-level controllers, which adjust valves and the vacuum pump speed. O_Distill is implemented with user-friendly configurations based on Online Control’s experience in the field of industrial automation and implementation of autopilots in the process industry. Online Control also offers consultancy services during the first project phase. O_Distill SimDist and O_Distill SimOptimizer are used to investigate operational strategies for the customer’s distillation columns, gain useful insight as well as to pre-setup and test off-line the O_Distill industrial software system.